Make Fontana your home! Fontana is a beautiful city with a large residential population. Fontana covers 52 square miles and has a population of 150,000 thousand people. Conveniently located, sitting at the intersection of two major freeways the 10 and 210. Metrolink rail service to the greater Los Angeles area runs through the center of town, and Fontana is only 10 minutes away from Ontario International Airport. Communities include Sierra Lakes, Village of Heritage, Southridge, Hunter’s Ridge, Citrus Heights, Shady Trails, Walnut Village among others. 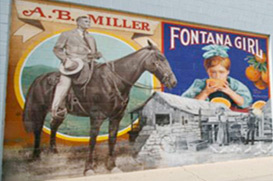 Starting with humble roots, as an agricultural community in 1913, Fontana has quickly risen among popular destinations to live. The city of Fontana has been striving for excellence for its residents. Fontana offers state of the art learning facilities such as the new Lewis Library and Technology Center, award-winning parks, community centers, and several unique entertainment and cultural arts venues. There truly is a plethora of activities to discover in Fontana. It’s no wonder Fontana was voted #24 in the Best 100 Communities for Young People by America’s Promise Alliance in 2008. Fontana is also the home of the Auto Club Speedway a NASCAR racetrack. Fontana is quickly becoming a destination in its on right, but if you want to look for adventure Fontana is conveniently located near mountain resorts, deserts, lakes and beaches. Fontana city leaders see bright prospects for the future of Fontana over the next 20 years as Fontana and the Inland Empire approach build out. The City has already embarked upon several aggressive programs that will set the course for the continued successful development of Fontana. We can help you buy a new home, house, townhouse, or condo in Fontana. If you are buying or selling a home, CG The Group can guide you through the entire process so that you can own Fontana real estate. Our free home buying tools give you the information you need to find Fontana homes for sale. If you are interested in Fontana foreclosures, Fontana bank-owned properties, and Fontana real-estate owned properties, you can find them through CG The Group. Our Fontana real estate agents and Fontana realtors provide professional service, and can help you with finding home loans and mortgage information. CG The Group is the best source for Fontana home statistics, Fontana demographics. The Fontana real estate market is competitive, so let our local Fontana real estate specialists help you out. Don’t forget to ask for the HOT List of Fontana homes! Contact us today! You can own your Fontana dream home sooner than you think! Bookmark www.IEHomeSearch.com right now and take advantage of CG The Group’s real estate tools. Search for Fontana homes for sale by getting complete access to the MLS in Fontana and surrounding areas. We have every house for sale in the MLS, including bank owned properties, REO homes, short sales, HUD homes, pre-foreclosure and probate properties, home auctions, condos and townhomes. Our goal is to provide you with the best and most complete information possible so you can find and purchase your new Fontana home with ease. Our website is updated daily with new home listings, pre-listings and local real estate news so make sure to check back on a regular basis to see what is going on in the Inland Empire real estate market.